Chamber Joins with Bethel Woods and Local Businesses to Celebrate the Woodstock Experience Woodstock, N.Y. - The Experience Woodstock Corridor, stretching from Woodstock&apos;s Village Green to Bethel Woods Center for the Arts, is now open for business. Visitors to the Woodstock area are invited to sample the many restaurants, shops, galleries, spas and performance venues that Woodstock has to offer. To complete their Woodstock experience, visitors are encouraged to enjoy The Museum, the performance stages, and the festivals of Bethel Woods Center for the Arts. Additional places of interest in Woodstock, Bethel, and points in between are being added to the program. The Experience Woodstock Corridor is the brainchild of the Woodstock Chamber of Commerce & Arts, whose mission it is to promote the Woodstock region as a premier four-season destination for cultural tourism. 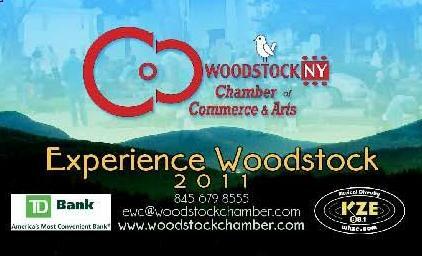 Powering the Corridor is the 2011 Experience Woodstock Card (EWC), now in its second year. Close to 80 Woodstock-area eateries, stores, spas, entertainment venues and service providers are currently making special offers through the card. These include The Museum at Bethel, which will give EW cardholders a preferred rate on their tickets. The 2011 card, still priced at $25, is good for unlimited usage throughout the calendar year. It can be purchased online from the Woodstock Chamber website (http://www.woodstockchamber.com), or at eight locations in Woodstock, including H. Houst & Son, TD Bank, Lily&apos;s Boutique and River Rock Health Spa. "The Woodstock Chamber is proud to offer visitors-and Woodstock residents-the Experience Woodstock Card," says Nick Altomare, acting president of the Chamber. "We&apos;re particularly pleased about our growing partnership with Bethel Woods Center for the Arts." Altomare noted that Bethel Woods has been actively promoting the Town of Woodstock through its group tours. In turn, last August the Woodstock Chamber sent a sold-out party bus to Bethel to enjoy The Museum, a picnic, and a Crosby, Stills & Nash concert. In 2011 the Chamber is planning to send at least four more party buses to Bethel. The Woodstock Chamber is committed to a leadership role in collaborating with Woodstock-area businesses, arts organizations, and local/county/state government to foster cultural tourism in the region. Through comprehensive planning and development it is working to support the local economy and the arts. As an example of the Chamber&apos;s vision: Local restaurants and farms benefit when tourists enjoy dining in Woodstock. These same visitors may choose lodging in town, then shop in local stores and galleries, and attend performances or take services at nearby venues. They may return again and again to the area, and even decide to retire in Woodstock or launch a business, thereby increasing the local tax base.